For the seventh consecutive year, Pizza Hut will collect donations in-store and online, all of which will go directly toward the World Food Programme’s operations to fight hunger. 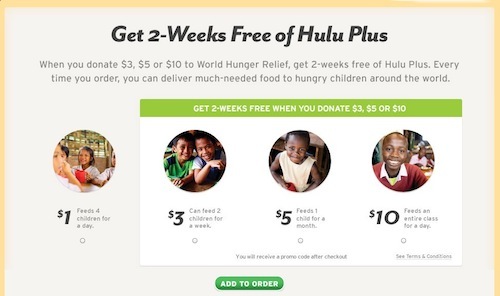 Pizza Hut consumers who donate $3, $5 or $10 online at PizzaHut.com will receive a free two-week subscription to Hulu Plus. Hulu will also donate up to $8 for each customer that retains his or her subscription to Hulu Plus for two months or longer. Pizza Hut’s parent company Yum! Brands spearheads the company’s hunger effort and recently announced a new PSA featuring Christina Aguilera (below), who has served as the campaign’s global spokesperson since 2009. According to Yum! Brands’, their annual World Hunger Relief effort is the world’s largest private sector hunger relief initiative, spanning more than 130 countries and over 39,000 KFC, Pizza Hut and Taco Bell restaurants. The initiative began in 2007 in an effort to raise awareness, volunteerism and funds for the United Nations World Food Programme and other hunger relief agencies. Since 2007, the effort has raised nearly $150 million and is helping to provide approximately 600 million meals. New this year, the campaign spells out exactly how many meals each suggested donation amount equals, a more tangible way to help consumers connect with the cause.